Heal yourself from the inside out Our immune systems can no longer be taken for granted. Current trends in public healthcare are disturbing: our increased air travel allows newly mutated bacteria and viruses to spread across the globe, antibiotic-resistant strains of bacteria out... read full description below. By Chopra, Deepak, M. D.
Heal yourself from the inside out Our immune systems can no longer be taken for granted. Current trends in public healthcare are disturbing: our increased air travel allows newly mutated bacteria and viruses to spread across the globe, antibiotic-resistant strains of bacteria outstrip the new drugs that are meant to fight them, deaths due to hospital-acquired infections are increasing, and the childhood vaccinations of our aging population are losing their effectiveness. Now more than ever, our well-being is at a dangerous crossroad. But there is hope, and the solution lies within ourselves. 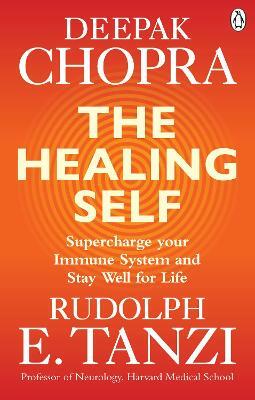 The Healing Self is the new breakthrough book in self-care by bestselling author and leader in integrative medicine Deepak Chopra and Harvard neuroscientist Rudolph E Tanzi. They argue that the brain possesses its own lymphatic system, meaning it is also tied into the body's general immune system. Based on this brand new discovery, they offer new ways of increasing the body's immune system by stimulating the brain and our genes, and through this they help us fight off illness and disease. Combined with new facts about the gut microbiome and lifestyle changes, diet and stress reduction, there is no doubt that this ground-breaking work will have an important effect on your immune system. Deepak Chopra (Author) Acknowledged as one of the world's greatest leaders in the field of mind/body medicine, Dr Deepak Chopra trained as an endocrinologist in India and the United States, and now runs the Chopra Center for Well Being in California. He has written many, popular books, which have been translated into 35 languages. He lectures and conducts seminars and workshops around the world. He is often covered by Time and CNN. He maintains a very popular website, and writes for the Washington Post, SF Chronicle and Huff Post. He is a regular blogger on huffingtonpost.com, belief.net, Yahoo Answers, Yahoo Health and Intent Blog. Visit his website at www.deepakchopra.com Rudolph E. Tanzi (Author) Prof Rudolph E. Tanzi is the Joseph P. and Rose F. Kennedy Professor of Neurology at Harvard University. Dr. Tanzi has been investigating the genetics of neurological disease since the 1980s, when he participated in the first study using genetic markers to find a disease gene (Huntington's disease). Dr Tanzi isolated the first Alzheimer's disease gene and discovered several others; he now heads the Alzheimer's Genome Project.